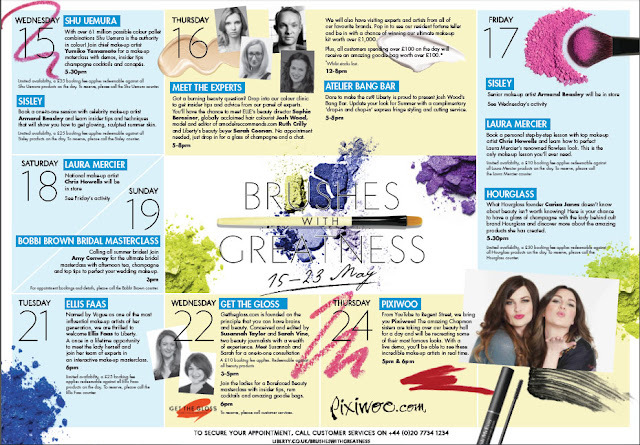 I've been meaning to blog about the amazing Brushes with Greatness event which is currently going on at Liberty's. A selection of amazing brands and makeup artists will be making appearances, they started last week but the event is still on. It will be ending it's last day with the lovely Pixiwoo sisters Nic and Sam on Thursday 24thMay. If only I lived a little lot closer I would be right at the front of queue! I'd love to know if you pop along to any of the days.